Wherever we go, we see all sorts of color and light. That’s a natural part of human life, so few non-scientists question why different objects are different colors or shades. But it is an interesting prospect to consider, which is why Sir Isaac Newton developed the atomic emission spectra, or "the spectra of frequencies of electromagnetic radiation emitted due to an atom or molecule making a transition from a high energy state to a lower energy state." To understand these spectra, we first have to understand the electromagnetic spectrum. The electromagnetic spectrum is "the range of frequencies of electromagnetic radiation and their respective wavelengths and photon energies." 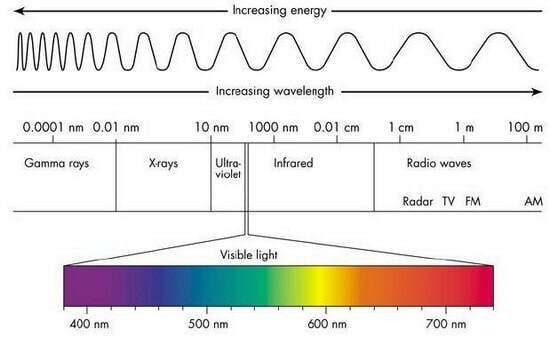 In the top section, we can see the increasing sizes of wavelengths, depending on the type of light. There is also an arrow above, pointing to the left, indicating increasing energy. We can draw a connection between the size of the wavelengths and the amount of energy by saying that the shorter the wavelength, the higher the energy. The section below this names the different types of light and the lengths of their respective wavelengths. Although all we see is visible light when we look around, it makes up an extremely small section of the electromagnetic spectrum, which we can see on a larger scale below. A prism or spectroscope allows us to see an element’s atomic emission spectrum. When we think of looking at light through a prism, we think of using white light from the sun, and through the prism, seeing the whole visible region. However, we’re not always seeing pure white light like that of the sun. Indoors, the artificial light we use to keep rooms bright will not look the same when viewed through a prism. These lights are made up of specific elements, and the light we see from these elements correspond to specific colors, which we will see in lines if we look through a spectroscope. 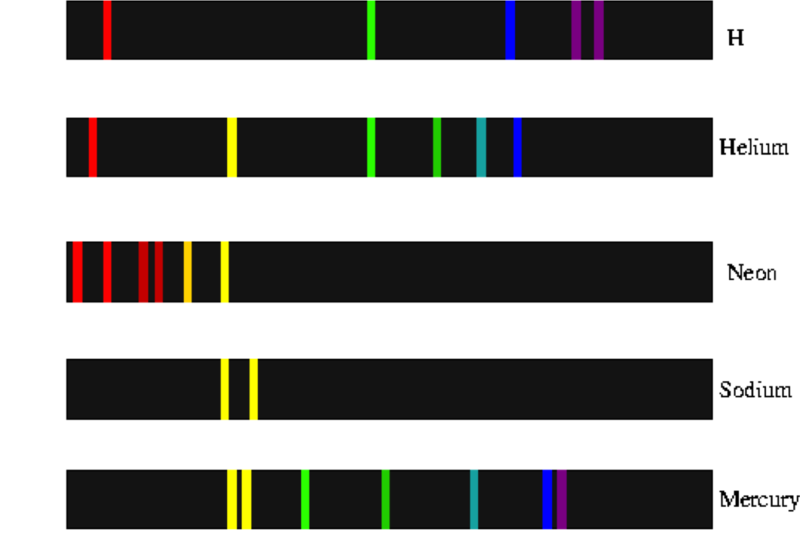 These lines or colors make up an element’s emission spectrum. A key point about the emission spectra we see is that each element has a unique set of lines or colors it gives off. Each element’s emission spectrum connects to that element’s set of discrete energy levels, which is illustrated by Bohr’s model. Every element has a specific number of electron orbits (equal to its period in the periodic table) that correspond to specific energy levels. When energy is added to an element or compound, the atoms undergo an energy change. 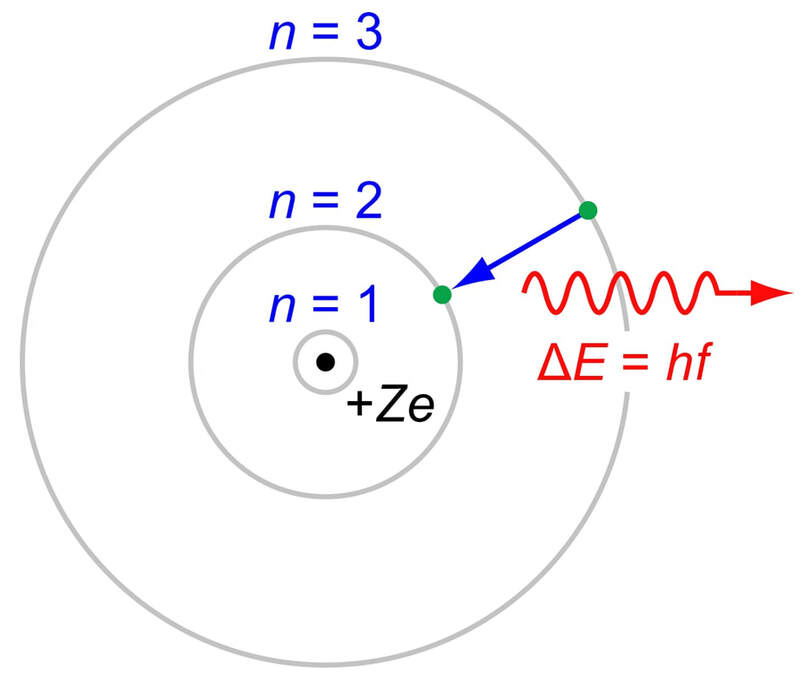 They begin in the ground state, where all electrons are as close to the nucleus as possible. When energy is added, the electrons absorb a specific amount that corresponds to the distance between allowed energy levels. The electron gets promoted and jumps to an orbit further away from the nucleus, putting the atom in its excited state. Then, because the atom needs to go back to its ground state to become more stable, the electron has to jump back to an orbit closer to the nucleus, emitting a photon of light in the process. When an atom emits a photon of light, the color of it corresponds directly with the route of demotion the electron takes. Because every element has a unique set of discrete energy levels, they also have unique routes that the electrons can take when they relax, and these routes correspond to different amounts of energy that are represented in the atom’s emission spectrum. Though the colors we see in the spectra are visible light, many elements give off light in other parts of the electromagnetic spectrum that we actually cannot see, such as infrared or ultraviolet. As humans, we see different colors of light all around us. We can use atomic emission light spectra to determine what elements are present in certain substances because we know that each element has a unique spectrum. If we were to look through a telescope into outer space, we would be able to use a spectroscope and see the emission spectra that are present in order to determine the elements that are out there.